SB5 Beach Telegraph …….. HOT PRESS …….. 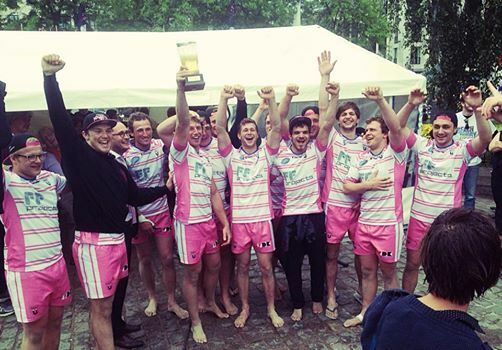 The MAGnificent MAGNETS have only gone and blown the doors off the season opener in Belgium and taken home the Title of 2014 Kortrijk Beach Rugby Champions beating Oemoemenoe (NL) in the final by 5-2. Mind you the scoreline suggests they didn’t have it all their own way. Nothing like a good warm up for the 2014 EBRA Series ! By the way, seems like the crew at RC Curtrycke Rugby Club should also be congratulated for their organisation of the Beach Arena in downtown Kortrijk! Just goes to show you can play Beach 5s Rugby anywhere ! RESPECT from the crew at SB5 Clubhouse. SUPER BEACH 5S RUGBY. Where next ?